OptimalLED has signed an “Exclusive Partnership” agreement with Mason Technologies Co., Ltd. to market products in North America. 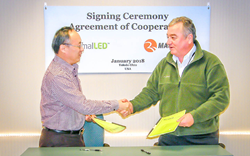 OptimalLED, a lighting manufacturer located in Toledo, Ohio is pleased to announce the Company has signed an “Exclusive Partnership” agreement with Mason Technologies Co., Ltd. out of Shenzhen, China. This exciting new partnership provides OptimalLED with the exclusive rights to market Mason products in North America. With this alliance comes the opportunity for OptimalLED to expand business in 2018 across the U.S., and that includes job growth. With corporate offices located in the Midwest, OptimalLED is a multi-million-dollar enterprise with a 50,000 sq. ft. fulfillment center who manufactures & imports LED lighting. Customers demand speed to market at a reasonable price but want assurances the product is aesthetically appealing and stringent quality control measures are in place. OptimalLED provides the best value in the lighting industry. “You get the convenience of dealing with Optimal’s best in class quality and customer service while taking advantage of superior design and quality which Mason offers. This line of products is not just another square brown shoebox fixture. The clean, rounded edge designs offer a European flare to everyday area lighting,” Mr. James added. This agreement is a major milestone in the 2018 planned growth strategy for OptimalLED. The executive team plans to hire new marketing, sales, and logistical support staff across the country. OptimalLED and Mason Technologies will be attending Lightfair International Tradeshow and Conference from May 6-10 at McCormick Place in Chicago, IL. Stop by booth #5244 for a product demonstration. For more information, visit http://www.optimalled.com or contact sales(at)optimalled(dot)com. OptimalLED Inc. is a leader in energy efficient technologies and a manufacturer/importer of LED lighting, the most energy efficient lighting solution available today. Founded on the principals of energy efficiency and the benefits it brings to the consumer, we believe the future of lighting and energy is marked by the speed with which we bring the latest technology to the consumer marketplace. The long-life LED technology we deliver to our clients today, will be the lighting used by generations to come. OptimalLED has a network supporting thousands of lighting professionals, contractors, distributors, and end users across the globe. For more information visit, optimalled.com.